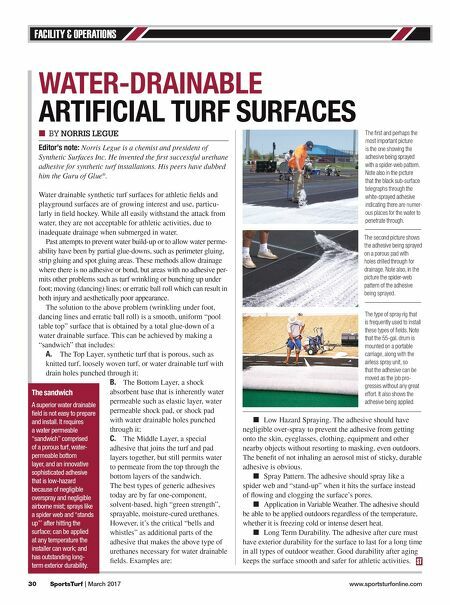 FACILITY & OPERATIONS 30 SportsTurf | March 2017 www.sportsturfonline.com WATER-DRAINABLE ARTIFICIAL TURF SURFACES ■ Low Hazard Spraying. The adhesive should have negligible over-spray to prevent the adhesive from getting onto the skin, eyeglasses, clothing, equipment and other nearby objects without resorting to masking, even outdoors. The benefit of not inhaling an aerosol mist of sticky, durable adhesive is obvious. ■ Spray Pattern. The adhesive should spray like a spider web and "stand-up" when it hits the surface instead of flowing and clogging the surface's pores. ■ Application in Variable Weather. The adhesive should be able to be applied outdoors regardless of the temperature, whether it is freezing cold or intense desert heat. ■ Long Term Durability. The adhesive after cure must have exterior durability for the surface to last for a long time in all types of outdoor weather. Good durability after aging keeps the surface smooth and safer for athletic activities. ■ BY NORRIS LEGUE Editor's note: Norris Legue is a chemist and president of Synthetic Surfaces Inc. 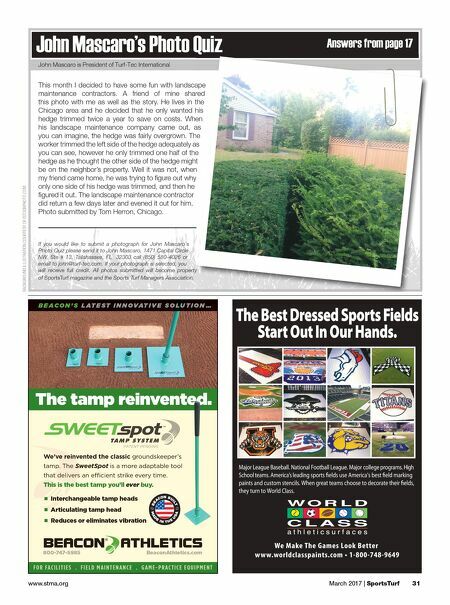 He invented the first successful urethane adhesive for synthetic turf installations. His peers have dubbed him the Guru of Glue ® . Water drainable synthetic turf surfaces for athletic fields and playground surfaces are of growing interest and use, particu- larly in field hockey. While all easily withstand the attack from water, they are not acceptable for athletic activities, due to inadequate drainage when submerged in water. Past attempts to prevent water build-up or to allow water perme- ability have been by partial glue-downs, such as perimeter gluing, strip gluing and spot gluing areas. These methods allow drainage where there is no adhesive or bond, but areas with no adhesive per- mits other problems such as turf wrinkling or bunching up under foot; moving (dancing) lines; or erratic ball roll which can result in both injury and aesthetically poor appearance. The solution to the above problem (wrinkling under foot, dancing lines and erratic ball roll) is a smooth, uniform "pool table top" surface that is obtained by a total glue-down of a water drainable surface. This can be achieved by making a "sandwich" that includes: A. The Top Layer, synthetic turf that is porous, such as knitted turf, loosely woven turf, or water drainable turf with drain holes punched through it; B. The Bottom Layer, a shock absorbent base that is inherently water permeable such as elastic layer, water permeable shock pad, or shock pad with water drainable holes punched through it; C. The Middle Layer, a special adhesive that joins the turf and pad layers together, but still permits water to permeate from the top through the bottom layers of the sandwich. The best types of generic adhesives today are by far one-component, solvent-based, high "green strength", sprayable, moisture-cured urethanes. However, it's the critical "bells and whistles" as additional parts of the adhesive that makes the above type of urethanes necessary for water drainable fields. Examples are: The sandwich A superior water drainable field is not easy to prepare and install. It requires a water permeable "sandwich" comprised of a porous turf, water- permeable bottom layer, and an innovative sophisticated adhesive that is low-hazard because of negligible overspray and negligible airborne mist; sprays like a spider web and "stands up"' after hitting the surface; can be applied at any temperature the installer can work; and has outstanding long- term exterior durability. The first and perhaps the most important picture is the one showing the adhesive being sprayed with a spider-web pattern. Note also in the picture that the black sub-surface telegraphs through the white-sprayed adhesive indicating there are numer- ous places for the water to penetrate through. The second picture shows the adhesive being sprayed on a porous pad with holes drilled through for drainage. Note also, in the picture the spider-web pattern of the adhesive being sprayed. The type of spray rig that is frequently used to install these types of fields. Note that the 55-gal. drum is mounted on a portable carriage, along with the airless spray unit, so that the adhesive can be moved as the job pro- gresses without any great effort. It also shows the adhesive being applied.